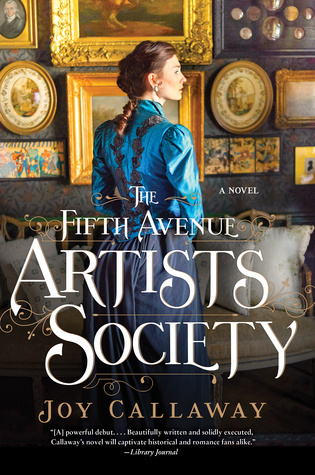 The Fifth Avenue Artists Society was my Tell Me What to Read choice for AUGUST, so I’m maybe running a smidge behind here. I requested the Kindle version from the library and kept not finishing it and finally, I just had to turn my Kindle on to airplane mode in November so it wouldn’t return and I didn’t request or download anything new until I finished it (the first week of January). I’m not even sure WHY it took me so long to get through it – I enjoyed it well enough, but I guess it never sucked me in enough to really prioritize it among my other reading choices. From the beginning, it felt like something of a Little Women retelling. The story is told by Virginia Loftin and she’s one of four sisters (along with a brother) in a very artistic family. One sister is a pianist, another creates hats, another is a dedicated teacher, and her brother paints. Virginia, of course, is a writer. Her dream is to become a celebrated novelist, despite the fact that in the 1890s, this is a hard thing for a woman to achieve. She knows exactly what publisher she’d want to work with, and she spends all her time writing. Aside from her literary dreams, her other main life plan is to marry Charlie, who lives next door and whom she’s known all her life. She is desperately in love with him and assumes he feels the same. But then in the opening chapter, he proposes to another girl, and it’s fairly clear it’s because this other girl comes from a very wealthy family and Charlie’s family is in financial straits (as is Virginia’s). She’s devastated, of course, and throws herself into her writing to try to forget her betrayal. Her brother, whom she’s very close to, invites her to join him at a salon on the ritzy Fifth Avenue, hosted by another writer, John Hopper. She’s thrilled to discover a whole group of equally passionate artists, musicians, actors, and writers, and Ginny starts to move on from her heartbreak as she and John become romantically involved. But then there are some crazy rumors going around about John and his womanizing ways, and also someone died right in the middle of the mansion at one of the salon meetings, and her brother seems to be spending more and more money, despite the fact that their family has had to live very frugally since their father’s death. Oh, and did you suspect that Charlie might not be out of the picture for good? You guessed right. When I was about halfway through the book, someone asked if I’d finished it yet and commented on how the last quarter of the book took a pretty crazy turn, almost like it was a totally separate book from the first part. Frankly, I’m not sure I am alert enough reader to have noticed that, but since she’d mentioned it, I definitely noticed the sudden change. Once I got about two-thirds through, I finished the whole thing in about 2 days, but man, it took me FOREVER to get to that point. I wasn’t particularly drawn in by any of the characters – it felt a little like you were supposed to like Virginia and Charlie because you like Jo and Laurie in Little Women, but I thought Charlie was pretty spineless and Virginia spent a lot of time locked in her room pining. Also, the other sisters kind of ran together to me, and I had a hard time keeping all the salon members straight (I’m sure reading this book over the course of 6 months didn’t help matters, not to mention reading on my Kindle which meant it was hard to flip back and check who various people were). It wasn’t a bad book, but it’s not one I’d particularly recommend or that I have any interest in going back to. I’d way rather read the read Little Women (or at least watch the movie version, which I deeply love). Anyone else read this one and have similar or totally different thoughts? Now, onto Peter Nimble and His Fantastic Eyes. It was the September choice, so clearly a book to be reading in February. . . . I mentioned that crazy turn in the story to you and I will give credit to listening to it during a 10 hour drive alone with my kids so I listened to the whole thing in a day and could compare the beginning and end quite easily. Still a weird book to me. On my kindle I have “X-ray” which lists all the characters with a quick description and links back to other pages where they’re mentioned. It helps me enormously. I seem to have a problem keeping characters straight in most books I read.